This is the one that didn’t make the cut for the East Hawaii Cultural Center‘s Spring Arts Fest 2011 competition and exhibition. I had a feeling this one might not make it. I had a vision when I took the photograph of trying to contrast the old Hawaii of local peoples and petroglyphs with the new Hawaii of luxury townhouses and part-time residents. 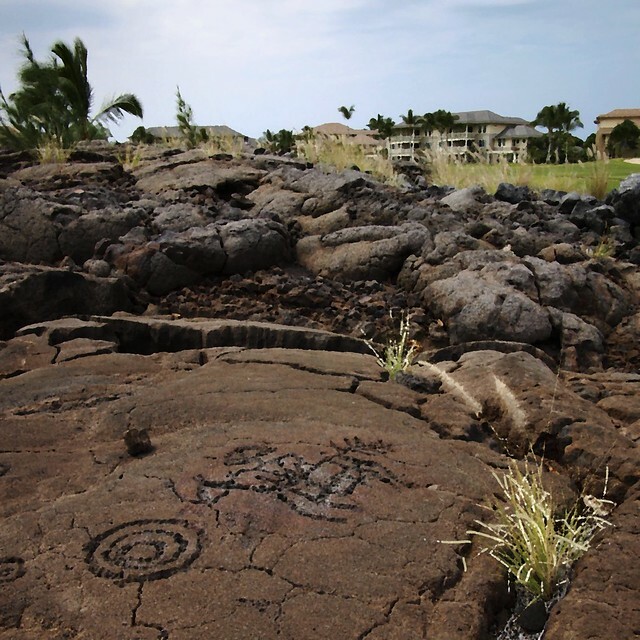 There are a lot of very interesting old petroglyphs (from the 1600s to 1800s) at this resort, just yards away from heavily watered green fairways and fancy condominiums. It’s a real contrast. I picked one of the better photographs and tried to “work it” into something that I felt was worthy of showing. In the end I was somewhat happy with it, but I was quite out of my normal style, wandering off into painterly-type plugins, etc. It didn’t feel quite right to me and maybe that also came through to the juror. OTOH, maybe it just wasn’t their cup of tea. I’m far from discouraged, however, since two of my other pieces made the cut. Longtime readers may recognize Self-Portrait, Kalapana and Psychic Barber, which are in. The opening is next Friday, April 1st. Looking forward to it.